Today I have a treat for you! eShakti is having a up-to-50% off sale Saturday and Sunday +free shipping with orders over 25$ AND I have a save an additional 20$ code ICBMT0811. The dresses shown here with the sale/my code are between ~25$-50$!Here are my favorites! Cutest print ever! I love the little rows of birds! I think this would look great dressed down with some boots and a nice military jacket. I think this would look amazing with a thick belt... you imagine the rest. It would look great on it's own with some pumps, or a nice pair of brown boots. OR belt an open cardi around this one. I think it would tone down the print and make it really trendy. Since you can make custom requests when you order, I'd ask to have this dress sit above the knee. I love this safari inspired dress. It's a beautiful silk/wool blend; great quality. I might swap the bow for a sturdier belt... but that's the beauty of this site: they do custom orders so I'd be able to ask them to not include the belt so I could add another one easier at home. Scoop front and back with gorgeous embroidery. Twisted straps. Agh! I love this dress--perfect for the holidays. Only 25$! You can never go wrong with sequins. I find this grey very soothing and not too loud--makes it perfect for anyone who isn't used to wearing sequins! If you look closely, you'll see the zigzag print. Gorgeous! 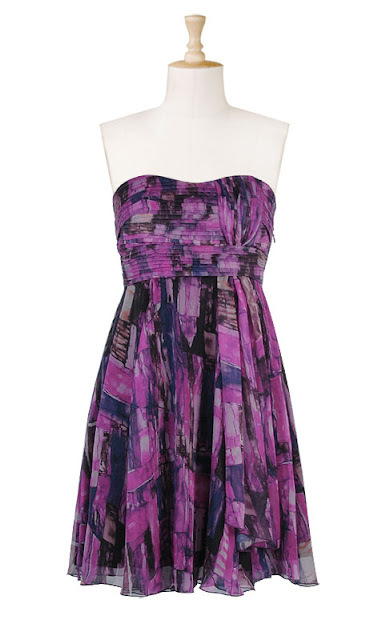 I love the colors of this dress and the lift and detailing around the waist. Cute flirty dress for a night out! Flouncy with a sweetheart neckline. I love the neat detail on the wrap up top on the left. For anyone nervous about ordering online because of sizing: eShakti offers custom fit. Simply give your measurements!